Well, O.K, I've got one of these things: a Peacock Hand Warmer. It does do what it's supposed to do: stay warm in your pocket for hours. In fact, sometimes it gets really hot and stays that way: leave it out all night when it's going well - without remembering to take off the little cap that holds the wad of catalytic fibres over the lighter-fuel reservoir - and it will, like as not, burn a hole in the natty tartan drawstring bag it comes in. It works. Thing is though, if you take it out of your pocket - say by the side of a steaming river at dusk in November or in a snow-covered, wind-blown field - and use it for any length of time to try and coax some feeling back into your frozen, insensible fingers - then it cools down pretty damn quick. 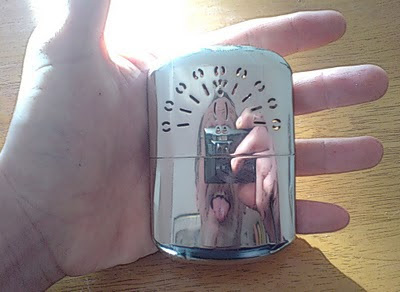 It keeps your pocket toasty as hell - and I'm not knocking that; having even one warm pocket on a winter's day is a happy thing - as any fule kno - but the times when I've wanted it to bring my cold, wet, frozen fingers back to life, my main memory is wishing the damn thing was warmer. Take it out of your pocket in the cold - it goes cold. I've never tried those burning charcoal stick hand-warmer thingies you can get - does anyone out there know if they're better than these Peacock jobbies? I suppose that there's a question to be asked about their respective carbon footprints? Well, I haven't got a clue about the answer to that question. Any ideas? 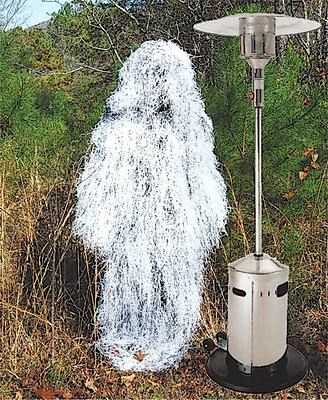 Were Tuvalu not in danger of being submerged I suppose the ideal cold weather hunting outfit might be something like a white Ghille suit plus a patio space heater. Very cosy. One or two questions regarding mobility do rather raise themselves, mind. Hi Hubert, I'm a big fan of the Peacock handwarmer (recently praised it on my blog, along with Sloe Gin, another great winter warmer!). In my experience, none of these gadgets (including the charcoal type) stays warm outside your pocket - you'd need a 1kW heater for that, or a decent campfire. Two Peacocks are a real luxury - best kept in the 'handwarmer' pockets of your coat, if it has one. Then to warm up your hands, put them in the pockets. Er, obviously. Or for a real treat, slip a Peacock in each trouser pocket. Mmmm. I find the charcoal type very hard to light without a blowtorch, and then they're inclined to go out. Not a lot better than Ötzi's birchbark container! That's good advice James, thanks; I can see that getting two of 'em and putting your hands in your pockets to get warm is going to work well. Sadly, I can also see that I'm too tight a bugger to buy another! Ah well. I've never used one of these - but your picture is especially cool! My Father used to have one of these, I did not know they were still available. When I went back to England after my Father died, I looked for his hand warmer, but could not find it. Well, that's funny - now that there are comments here, this comment form shows up. Yay! But I swear it wasn't here for me when there were no comments yet. That is friggen hilarious! I actually tried something like this when I first started hunting in California as a teen. yes, even California can seem like Alaska when you're raised in the tropics of Southeast Asia. That hand heater had a solid fuel rod that burned through, left a lot of ash and nearly burned my hand off one morning while rabbit hunting. I definitely prefer your suggested snow ghillie suit and lamp heater :-D ! Just got a new .22 Digital Camo Crossman with nice 3x9 scope and looking forward to using it with knowledge gained from your posts! Best was the Charcoal stick HW - I found it was really warm, bordering on hot quite often, although I thought it was still good outside the pocket but did lose a bit of heat - just not as much as the other two. 2nd best is the powdered sachet ones, as they're pretty easy to use (no lighting, carrying extra fuel etc) and last for about 8-10 hours when I use them, BUT they do lose a lot of heat outside the pocket and I'd only describe them as 'Very Warm' and not 'Hot'. 3rd would be the Gel HW - The big plus is it's reusable, and warms up pretty instantly, but isn't really hot and cools very quickly if you don't constantly massage it. Out of the above three, I'm using the sachet HW's at the moment as I bought a box full, and they strike a good balence for me.. I'd like to try a peacock HW though, as they look very cool, and even Zippo do a similar device..
Hubert - may I post a link to an online shop (friends of mine) for the sachet handwarmers? Mentioning my name will get a discount! That's very interesting Fred, thanks for posting and yes, of course, go right ahead and post that link here! Brillaint, well go to http://bm-camping.co.uk or call the shop on 01823 461 414 and mention that <span>Fred</span> told you about B&M<span><span></span></span> Camping, and they will give you a discount on anything you might want to order! I'll sort out a discount code with them to get a specific discount to use in the online shop, as at the moment the discount will be over the phone only..